Keith Moor was the Herald Sun journalist who produced the wholly false story claiming that Schapelle Corby had been photographed with a drug dealer prior to her arrest. The photographs had been seized by the police following a raid on the home of a petty criminal, and their existence was quickly leaked. It later emerged that the photographs were actually taken from within Kerobokan prison, and the criminal was merely one of the many people who visited and posed for photographs with her whilst she was on remand. Neither Moor, nor the police, ever apologised for the damage this false allegation caused. 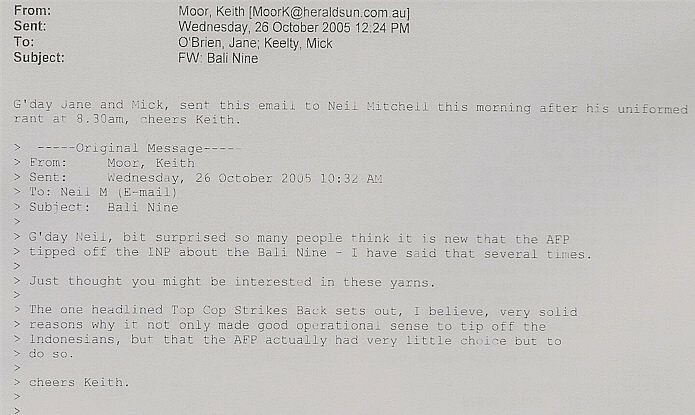 The following email extracts, in which Moor proudly demonstrates his work in defending the AFP to another journalist, reveal his relationship with AFP Commissioner Keelty. Moor's false story appeared just a few weeks later, during Schapelle Corby's appeal process. The timing could not have been worse, in terms of negative influence upon the outcome. In 2016 the relationship between Keelty and Moor was further illuminated when it emerged that Keelty had written the forward to a book written by Moor on an unrelated story (Busted).